Ashley Ramirez is the face behind the Teachers Pay Teachers store, Texas Lonestar Teacher. She strives to provide her students with relevant and engaging information that they can constantly have at their fingertips. I wanted to have Ashley share with you how she manages to provide rigorous content daily that her kids look forward to. One of the things Ashley uses that helps her children become lifelong readers is current events. Ashley ROCKS at this and makes her kids feel safe and heard while talking about topics that are happening currently and making those real life connections. She walks us through why she uses current events in the classroom, how she uses it, and even gives you tips on how you can use it too. Now let me introduce you to Ashley Ramirez! 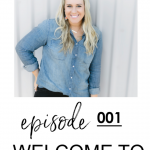 Ashley: All right Ash, I am so excited that you’re here with me today on the very first guest episode of the podcast. For people who might not know who you are, tell us a little bit about you and your teaching career. Ashley Ramirez: Hello. I’m so excited to be here. I’m actually a the fifth grade teacher in San Antonio, Texas. I have been teaching for eight years now and I have definitely had a range of teaching from second and all the way up until fifth grade, which I currently love so much. Truly my passion in teaching is creating collaborative learning opportunities for my students and I love initiating school wide events. For me, it’s all about sharing those ideas and creative resources with teachers. So, that’s how I jumped into the whole Instagram world and Teachers Pay Teachers. Ashley: I love that. That’s awesome! I love that you like to do things with your class but then you like to expand it into school, which I think is sometimes hard to find. So, I think that’s really awesome. So, you currently teach fifth grade and what do you like most about fifth grade? Ashley Ramirez: So, what I really love is that we are departmentalized. This is my first year focusing only on reading and social studies and those two happen to be my absolute favorite. So, it was just kind of like my world came together when I got to move to fifth grade. I could totally see myself teaching these two subjects forever. Ashley:	That’s awesome! I love that. I asked you to chat with me for many reasons, but one of the reasons I really want to talk to you about is current events in the classroom. I know that you are really passionate about this and you do a great job at it. You’ve helped me get started with integrating current events with my students even as a third grade teacher. I want to talk a lot about that today so that teachers who maybe don’t know how to do this, haven’t even thought of it or are wanting to know more information about it, can get help on getting started with this and you can help us with that! So, tell us a little bit about using current events in the classroom. Ashley Ramirez: So, for me I have always planned reading in every grade level that I have taught from second through fifth grade and I’ve just noticed how difficult nonfiction texts as a unit can be. I felt like my students weren’t connecting with the material and they weren’t engaging with it in a very relevant way.I just wanted to find a way to change that and to help them connect with the text and to just make it meaningful for them. So, current events came into our classroom in that way and at the same time there was also so much happening around the world that I wanted to share with my students, but I needed a student friendly format to share with them. News articles from so many different sites and papers just kind of came to life in our classroom in that way. It just tied in so perfectly with nonfiction, but also offering them that opportunity to choose to read news articles. For some of them, that’s the genre that they love the most. 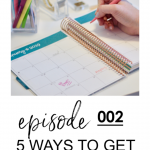 Ashley: I like when you said, “It can be really hard to make current event topics able to be taught to students in a nice friendly way.” So, that’s very important as teachers that we do that, but it can be hard to find resources or ideas on how to do that in the best way. So, I think you do that very well. How would you say current events and integrating it into your classroom and into your week in your stations or lessons or whatever you do… how has it changed your classroom? How has it changed your students? You told us a little bit, but how else do you feel like it’s really enhanced your classroom? Ashley Ramirez: I feel that I constantly share with my students that our classroom is a safe environment. It is a place for all thoughts and all opinions. It’s one thing to say that to them, but it’s another thing completely to show it to them and I feel like current events opened that space- that safe space for them to voice their strongest opinions and to really create teachable moments that bring our whole classroom community together. I felt that by incorporating current events I’m not just telling them “Hey your voice matters, your opinion matters, and this is a safe spot.” I feel like I’m showing that to them and we’re interacting with the material and they’re completely hooked in. I feel that sometimes they have inhibitions towards nonfiction texts and skills and passages and whatnot, but this doesn’t feel like work to them. All those skills are coming into play and it doesn’t feel like “Oh my gosh, what do I do if I come to a nonfiction text feature? What about the subheadings?” It just all kind of comes together in this nice, creative way that doesn’t feel like work. I feel like for them it’s a total win-win for them and for me. Ashley: Yeah for sure! I know you’ll talk a little bit later about ways to do this in the classroom, but I will say that seeing my third graders use your current event ideas and resources in our classroom every week….instead of being like, “OK, I am now going to be teaching nonfiction text features!”…. I still do that, but it’s not the only time we talk about nonfiction and it’s not the only time my kids are exposed to that. Relating it to what’s actually happening around them is so meaningful. I see how they reflect and they connect to the articles as the text and it’s just crazy because, like you said you teach fifth grade, but I teach third grade so honestly, I think this can be applied to a lot of different grade levels and there are so many benefits to putting this into your classroom and into your curriculum supplementing that. Ashley Ramirez: You mentioned how you do teach those nonfiction like units and what I always found was you teach your nonfiction unit and then you move on to the next thing. Fluidly incorporating your current events into the classroom, you are constantly practicing those really strong nonfiction skills. As a fifth grade teacher, I also have readers at a third grade level and I feel that there’s just so many ways to incorporate it and to include your readers on so many different levels in just a friendly student format. I love that I can inform them whether they’re on a third grade reading level all the way up to fifth grade and beyond and we can still connect on that material. It’s not just “OK, this week is our nonfiction week!”…it’s just a constant, it’s become part of our routine, part of our norm. And on top of that I have yet to have a student that says, “Oh my gosh current events again?” I never have that response and for me, those are the moments I love about teaching. Ashley: Yeah for sure. I totally agree. So, let’s talk about teachers and how they can do this in their classrooms and ideas that you have and resources that you have for them to get started. What would be your number one tip or tips for teachers including current events into their classroom? 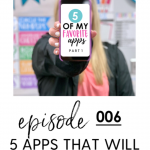 Ashley Ramirez: I think my number one tip is that every time you see something fun or engaging that you find you know on Instagram or through a blog or through Teachers Pay Teachers, I think you just have to keep an open mind about it and throughout the entire process. Take what you learn and tweak it for your students and your classroom. So, anything that’s being shared can be made and formatted for your own particular needs. So, for sure throughout the whole process, I strongly believe in keeping an open mind. Keep an open mind through the different articles that you incorporate into your classroom. Again, your students have strong opinions. They have a voice and keep an open mind towards those opinions. They may not be the most popular, but this is your moment to show how important acceptance is in your classroom in diversity. Ashley Ramirez: I would also keep an open mind for how you work it into your daily or weekly routine. Again, it’s all about what works most for you and your students. It just matters to start and to incorporate it. You could totally read an article a day, you could turn this into a station rotation, or it could be part of your whole group lesson. What I love most is just offering it up as a self-selected reading option to my students because we do have our independent reading time and they can choose any material they want. I like how this is an option for them and I even offer it as an early finisher task. So, students who finish an assignment and go above and beyond and finish it completely- this is an option for them. So, I think it’s just all about keeping an open mind and making it work for you and your students. And just being flexible with the process as a whole. I have totally started out with current events one way and as my students change and my own teaching changes, it starts to change too. So, it’s definitely all about what works for you. Ashley:	Yeah, and I say this a lot, but it applies to everything. Students will rise to the expectation that you set. So, it’s like I know a lot of teachers might think like “Oh well, my kids are way too young for this! or “This won’t work with my students!” You know, I just don’t think that’s necessarily true one hundred percent of the time. Another tip is just to set that expectation and like you said if you need to tweak it for your class or your age group it’s totally doable. 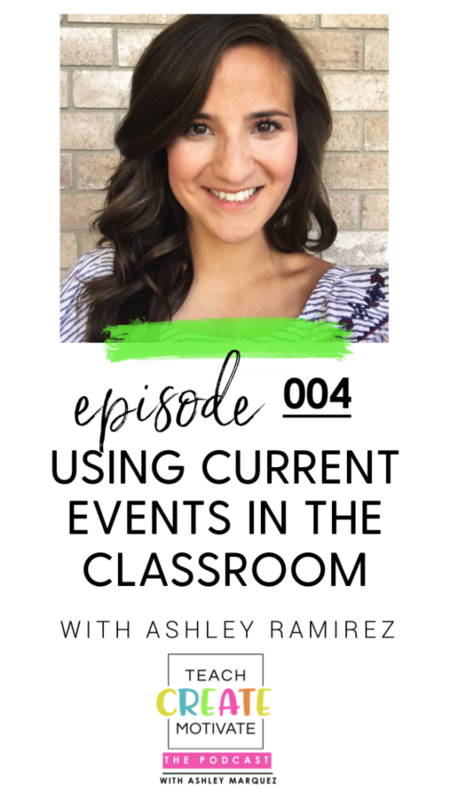 Ashley: So, why is current events and using those and teaching those and giving your students exposure to learning about them…why is that so beneficial to students and to classrooms everywhere? Ashley Ramirez: I always come back to my “why” as a fifth grade reading teacher and a state testing grade level. And my job my, passion is not to create the best test takers. I don’t want them to engage with a nonfiction text and think, “this is how I annotate the text, this is how I answer this kind of nonfiction question.” I want to create lifelong readers and this is all part of that. Ultimately, I want to show them that this is the kind of reading you would do once you leave me, once you leave fifth-grade. It’s not all about a test. It’s really all about creating that lifelong reader and that passion and drive to read. And again, my students are all in when it comes to current events. They love when I choose an article or when their peers choose it. I have yet to hear anyone ever make a comment saying that they don’t want to read it. There’s always something out there for everyone and that’s what I love! It’s totally unique to your students and it brings them together. Ashley: So, you’re saying that sometimes you have the students choose the articles then? Ashley Ramirez: They absolutely do. This is part of them taking ownership of their learning and also just bringing our community together and having them choose and incorporate it into our classroom…. It’s huge! Ashley: That’s great! I love that. I LOVE student leadership and choice. I love love love it. So that’s awesome! So how do you do this? How do you put current events into your classroom, into your teaching, into your day? You kind of said as a station or a whole group activity, but what do you actually do that teachers can take from this or can you tell us more about that part? Ashley Ramirez: I do have a News Article Interactive Bulletin Board resource that I utilize. I wanted the articles to be more than something I put into our classroom library. I wanted it to take up an actual piece of space in our classroom. I want it to be a huge focal point. So that’s what I use. We also do leadership roles in our classroom, so every student has a leadership role and they apply for them and one of them is called a “News Crew.” And so, two students end up being chosen for a News Crew and it’s their job to collaborate. They find a way, they synergize together to find a way to share an article with us each week. So, sometimes one partner is the one choosing the articles, sometimes the next week it’s the other and sometimes it’s the both of them coming together. They also like to come to me and ask my opinion. But it’s two News Crew Leaders and they select our article that we are going to read for the week during our stations. Then, in their station rotations they’ll reflect on a response card or on a Google slide and then by the end of the week we take all of their responses and we use that to lead our morning meeting discussion. So, it’s definitely been built into our week and our weekly routine. I found that as a teacher, I do so much better when I’m on a routine and I have a set schedule. So, if I was trying to incorporate current events and I wanted to make it a focal point, I just felt like I had to build the time in for it. I had to make it an actual station. Otherwise, it would have been one of those things for me that would have turned into “Oh, maybe I’ll get to it!” or “Maybe next week I’ll put it in the plans.” So, I just know for me I work best when I have a structured routine and the students also know that we are going to expect an article a week. Ashley: It’s so interesting hearing you talk because what you’re saying, I kind of do that with my kids, but I also do it my own way because what works for you might not work for my classroom. I love that you have the News Crew job. I personally choose articles for my kids just because I think maybe as third graders, I’m still choosing it for them, but I love that option to have them go out and that’s part of their job to do that. And then like you said, having a specific time to talk about the article and their responses because otherwise it just doesn’t make time for that and you don’t have that routine like you’re saying. I’ve been guilty of a week or two where they just kind of sit there and then we don’t even talk about it and unless there’s a specific schedule of when you are going to have your kids meet and talk about what they thought and how they reflected to the article…. it’s just going to be something else that gets put on your back burner. So, that’s really good point too. Ashley Ramirez: And it happens to me too. Like last week, we had two field trips and parent conferences coming up that we’re also prepping for as well. Things happen and my routine will change, but what I love about my board is that regardless of our routine like I said earlier, the articles are also available for my students to read in their self-selected reading time or their independent reading time. So, if I’m anticipating a crazy week, I’ll still display articles for them because things happen without notice like a News Crew member being out. Ashley Ramirez: So, in order for me to prepare for that, having that designated space to display the articles for them is important and I know that way they’re still getting that quality time. They’re still getting the opportunity. That’s the other thing, no matter what, I constantly want to offer the opportunity for my students to read these things because I come back to what we do in our classroom and what we offer as teachers. That might be the only time our students ever have that opportunity to read or to do things or to engage with the material in that way. That might be their only time out of the entire day. So, whatever happens, I just make sure it’s always an option for students in some shape or form. Ashley:	I like that we’re both being very transparent about that because it’s like we’re giving ideas for teachers everywhere, but at the same time everybody’s human and it doesn’t always work out the way we want it to, but we strive to do that in the best way. Then, teaching the whole child is something I’m really passionate about and this can go right into that because they might not and probably are not really getting this kind of exposure to current events every week. You know, maybe here and there when the news is on or when their parents are talking about it or you know on their phones or their devices, but intentional teaching of what’s going on around them and not just knowing about it, but reflecting on it and having an opinion on it, I think, is amazing. Ashley: So, what are some quick tips for teachers who are just starting out with this or that want to incorporate more or dive right into this? What would you tell them? Where can they go? What should they do? Ashley Ramirez: I have put together a poster on my Instagram that I’m going I’m going to share and it’s just full of free ideas of places you can go to grab articles. Again, coming back to keeping an open mind..some of these are websites, but you could definitely print them. If you’re a one-to-one classroom you could offer it and put it into like your Google Classroom send it as a link. You have so many options so just because some of these are online it doesn’t mean it should stop your students from having access. One of my absolute favorite places to go is Newsela.com or Newsela. You’ll sign up for a free account and then you have access to so many articles and give your students access. Also, on Newsela it’s very easy to print and they’re easy to share and you can even save articles and come back to them later. So, on this site you can also differentiate making sure your student who is reading below grade level, so maybe some of my students are reading at a third-grade level, can still interact with the content just as easily as someone who is reading on grade level. So, you can differentiate the Lexile, which I think is so awesome and so important. If you wanted to take it further, you could even assign articles, annotate them and you can even give quizzes. However, I just use it for reading because I feel like we get so much practice with quizzes and assessments that I really just want this to be enjoyable. I want it to be something separate from test taking and also just very reflective. So, that’s my ultimate goal, but with this site, you could do so much. Ashley Ramirez:	The next one is Scholastic News Online. They offer headline articles in a very kid friendly format and you don’t have to subscribe to the magazines or create an account to access the articles they are online. So again, you could actually print them. What I really love about this is the kids are actually the ones that are writing and reporting the articles, so I think that’s pretty cool for your students to see. I think for me I feel some of them have it in their mind “Oh, I’m a fifth grader, you know my future might be writing,” but this is kind of showing them that it can be it can happen. This could be you! Ashley: I had no idea that kids are writing those. That’s so cool! Ashley Ramirez: It’s insane. So, this is their online site. Have you subscribed to this Scholastic News Magazine? Ashley Ramirez: I absolutely love that one too and I’ve had it before and Time for Kids. So, I’ve always gotten a small group set and had to share it amongst my team. So, I’ve held onto those regardless. They’re still so great to use and the material is still relevant. I hold onto magazines over the years. Ashley:	So do I and then if I need an article, I’ll just grab one from what I’ve already put away you know. Ashley Ramirez: Yes, it’s easy access. So hold onto those. Also, our school librarian has a subscription and so you can totally access it that way and make copies. Again, my students read these articles in stations. So, I don’t ever truly need a full classroom set, but this is another way to make it happen. Then there is the Smithsonian Tween Tribune. The website would be Tweentribune.com. It’s pretty similar to Newsela so you can search for articles based on your topic, your grade level or even your Lexile level. You can sign up for a free teacher account and you can assign and quiz your students again. A lot of interesting articles on there. Ashley Ramirez: Dogo news was another one. I don’t access this one as much… my students truly love newsela. That’s probably one of the most popular and they love scholastic, but this is another one to look into. DogoNews.com is another free safe environment for your students to find the articles. I think that maybe one of your biggest concerns as a teacher may be “How do I present this in a kid friendly format?” What I love about all these sites and ideas is it does present it to them in a neutral, student-friendly format so that they can form their opinions on what they’re writing, and they can be presented with both sides of the information, whether it’s a debate or an opinion. Again, super student-friendly. Some other ideas that may not have crossed your mind…incorporating families and bringing them into the classroom and making them feel like they’re right there with you. You could invite them to bring in newspaper articles. You could invite them to search for some with your students that way you’re building that reading connection at home. Ashley: A great idea. I love and have to get better about using the Newsela because I forget that it’s there. Like you were saying, you don’t need a whole class set because that’s what I do. I only get a few Scholastic News whenever I order it. Then, I do a station as well. So, I have a lot more to come on stations on the podcasts and I will be sharing that, but I personally have my kids do it once a week in a station. So, they’re not all responding or reading at the same time. You don’t necessarily need one to one magazines or articles. If you’re printing them out or even assigning it through digital ways, you don’t really necessarily need every student to have one at the same time if you choose to do it that way. Ashley: So, you do have some great resources on this topic. I use them in my classroom! What resources do you have and where can teachers find more about those resources? Connect with Ashley for More Ideas! 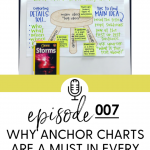 Ashley Ramirez: On my Instagram, Texas Lone Star Teacher, I have in my highlights a section called “News” and this is where I put together all of my posts in one spot so that you can find the ideas I just shared and find more about my News Article interactive Bulletin Board. Again, as my students change and as I change as a teacher and kind of incorporate new things, I will continue to post in there, my board can be found on my Teachers Pay Teachers site,Texas Lone Star Teacher and again if you ever feel like you need you know some more guidance on this I am totally available. Send me a message on Instagram or an email. I am more than happy and ready to get it going in your classroom because it really is so changing. I couldn’t imagine a classroom without it. Ashley: I love that yeah, if you’ve seen online, which I’m sure you have the Currently Boards, those are hers. So that’s kind of what she’s talking about when she’s talking about that News Article Bulletin Board. Like she said, you can find that in her store. I love that you shared all of that stuff about current events. Like you said, I think it’s so important that teachers are always trying to learn new things to better our classrooms and our students and I think this is a really really great example of something that we can all be doing. It will benefit all of us. It was so fun talking with you today! Thanks for sharing your passion for teaching current events with us! Ashley Ramirez: Thank you! I really hope that teachers everywhere can take these ideas and make it work for their classroom.